Shop for local produce, eggs, imported pasta, and house-baked goods like whoopie pies. This place literally caters to rock stars--David Byrne and his band once ate burgers right out front. 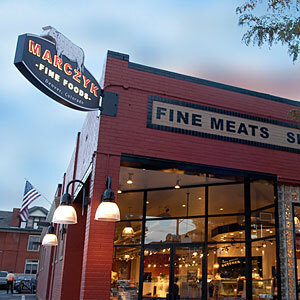 But Marczyk is the kind of place for anyone looking for a casual sit-down meal, takeout, or quality groceries. Shop for local produce, eggs, imported pasta, and house-baked goods like whoopie pies. This place literally caters to rock stars–David Byrne and his band once ate burgers right out front. But Marczyk is the kind of place for anyone looking for a casual sit-down meal, takeout, or quality groceries.